June 28 (Reuters) – Britain’s vote to leave the European Union continued to reverberate through financial markets, with the pound falling to its lowest level in 31 years, despite government attempts to relieve some of the confusion about the political and economic outlook. UK finance minister George Osborne said early Monday that the British economy was strong enough to cope with the market volatility caused by last week’s “Brexit” referendum which has resulted in the biggest blow since World War Two to the European goal of forging greater unity. “Our economy is about as strong as it could be to confront the challenge our country now faces,” Osborne told reporters. “It is inevitable after Thursday’s vote that Britain’s economy is going to have to adjust to the new situation we find ourselves in,” said Osborne, who later ruled himself out of the running to succeed David Cameron as prime minister. Boris Johnson, a leading proponent of Brexit and the frontrunner to be the next prime minister, praised Osborne for saying “some reassuring things to the markets”. But neither Osborne’s nor Johnson’s words failed to stop the slide in stocks on world markets which began last Friday when Britons confounded investors’ expectations by voting to end 43 years of EU membership. Asian stocks markets opened weaker on Tuesday, with MSCI’s Asia ex-Japan index extending losses for a third day, down 0.5 percent. 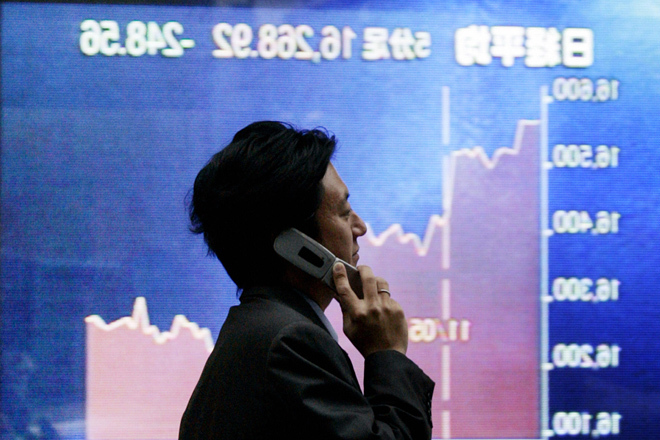 Japan’s Nikkei was off 0.7 percent. “Markets already appear to be pricing in a full-blown recession in the U.K. and rising recession risk in the rest of Europe,” said David Donabedian, chief investment officer of Atlantic Trust Private Wealth Management. Ratings agency Standard & Poor’s stripped Britain of its last remaining top-notch credit rating on Monday, warning that more downgrades could follow. U.S. stocks ended lower for a second day also, following European markets, pulled down by banking stocks amid uncertainty over London’s future as the region’s financial capital. Safe-haven bond and gold prices rose. U.S. Treasury Secretary Jack Lew on Monday said he sees no signs of a financial crisis arising from Britain’s decision last week, although he admitted that the result does present additional “headwinds” for the U.S. economy. Visiting Brussels, U.S. Secretary of State John Kerry said it was important that “nobody loses their head” as the EU and Britain deal with the fallout from the referendum. European Central Bank President Mario Draghi expressed “sadness” on Monday at Britain’s vote to leave the European Union. With the ruling U.K. Conservative party looking for a new leader after Cameron’s resignation on Friday and lawmakers from the opposition Labour party stepping up a rebellion against their leader, Britain sank deeper into political chaos. “There’s no political leadership in the UK right when markets need the reassurance of direction,” said Luke Hickmore of Aberdeen Asset Management, expressing the view of many in the City of London financial centre. British broadcaster Sky News said work and pensions minister Stephen Crabb was also considering a bid for the Conservative party leadership, with business secretary Sajid Javid seeking to become finance minister. Both were in favour of staying in the EU. The editor of the Spectator magazine tweeted that Health Secretary Jeremy Hunt was also “highly likely” to launch a bid. The prime minister sought to calm fears over the fallout of the referendum and said parliament should not try to block Britain’s departure. A majority of parliamentarians, like him, had argued that Britain should stay in the EU. “I am clear, and the cabinet agreed this morning, that the decision must be accepted,” Cameron told parliament, which also faces a public petition for a new referendum. While the question of whether to leave the EU has split the ruling Conservative party, divisions within the opposition are also deep. A wave of Labour lawmakers resigned from leader Jeremy Corbyn’s team on Monday, adding to the 11 senior figures who quit on Sunday, saying his campaign to keep Britain in the EU was half-hearted. Piling on misery for beaten English “remain” voters, the country’s soccer team on Monday crashed out of the Euro 2016 soccer competition to tiny Iceland. “We embarrassed ourselves three of four days ago in the referendum, we’ve embarrassed ourselves now. It’s a really, really sad time to be English,” lamented English soccer fan Alex in the French city of Nice. Cameron’s refusal to start formal moves to pull the country out of the EU has prompted many European leaders to demand quicker action by Britain, the EU’s second largest economy after Germany, to leave the 28-country bloc. “It should be implemented quickly. We cannot remain in an uncertain and indefinite situation,” French Finance Minister Michel Sapin said on France 2 television. Guenther Oettinger, German member of the EU’s executive European Commission, said delay would hurt Europe as well as Britain. “Every day of uncertainty prevents investors from putting their funds into Britain, and also other European markets,” he told Deutschlandfunk radio.